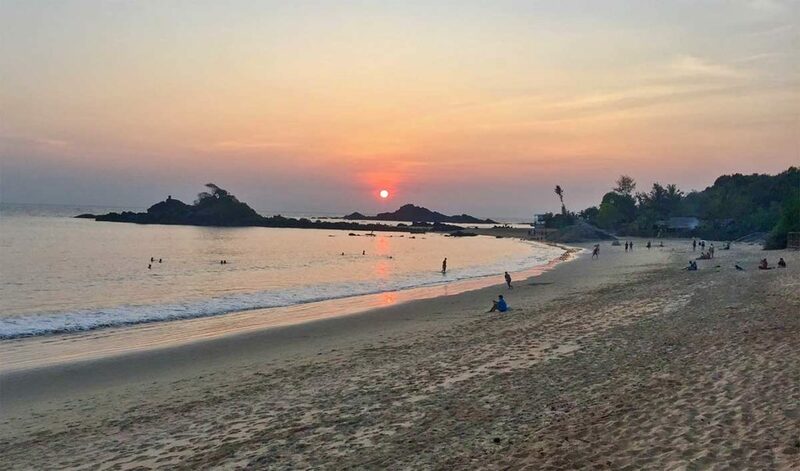 Why yoga in Om Beach, Gokarna? Beautiful tan sand. Warm, clear, blue water. Wild monkeys and dolphins. The most gorgeous sunsets on the horizon. This is paradise. This is Om Beach. “OM” is the universal sound. It has significance to yoga. Om Beach is shaped like the sanskrit symbol for the word “OM”. It’s a short 10-minute tuk tuk drive from Gokarna, a spiritual city in the state of Karnataka, just south of Goa. We offer eight 100 and 200-hour trainings at Om Beach from October through March. Scroll down for our training course packages. Are you craving the beach? Hot sand and cool waves? Do you dream of doing yoga then seeing the sun set over the ocean horizon? We offer retreat packages for all levels and needs. Scroll down for our retreat packages. We offer drop-in classes from 8 – 9:30 AM and 4 – 5:30 PM every day except Sunday. Yes, we have mats. Yes, you can attend if you’re a first-timer or not flexible. Costs are posted outside the shala. Click here for directions. Shanti Yoga partners with the best guest houses close to the shala. Your guest house will be within a 10-minute walk, often less. If you book a training you will receive a private room included in the price. If you book a retreat you can choose single/private or shared accommodation (2 per room). When sharing you will be partnered with one other student of the same gender. Or, if you’re a couple, you can choose to share one double room. Your room will be clean, comfortable, and quiet. A perfect respite. The food in Om Beach is incredibly fresh. The restaurants near the shala source the freshest, healthiest produce from local farms. We encourage you to enjoy healthy vegetarian meals. If you book a training you are responsible for your own food. This keeps costs low and provides you with the option of finding your favorite food. We find it’s best to let our students buy their own meals so we can focus on running the best training. Meal costs are variable – some people need to eat more, some less. Meals are available at many restaurants close by (within a 10-minute walk). We recommend budgeting $10 USD/day for meals. If you eat light, you’ll find sticking to this budget easy. If you eat more you might spend more. We provide two complimentary fruit and tea breaks during the day. When you decide to dine out in Om Beach you will have many delicious options. All restaurants on the beach are very close to the school – within a 10-minute walk. Check out the specials at the Om Shree Ganesh restaurant over the bridge. Nirvana Cafe has the best local coffees and international espressos on the beach. Don’t miss the dessert specials at Manikarna Restaurant. Shanti Yoga School is located behind the Om Shree Ganesh restaurant and guest house. Reach out to us via our contact page. Dabolim airport in Goa is the nearest airport, 160 km away. It is well connected to Indian and international cities. Gokarna has its own rail link which is well connected with Margao station. The last train from Margao to Gokarna station leaves at 1 PM and takes 1.5 – 2.5 hours, depending on which train you take. Alternatively, you can take the train to Ankola station which is about 20 kilometers away from Gokarna. This train journey is also 1.5 – 2.5 hours, depending on which train you take. From Ankola station, take a taxi or bus to Gokarna town. No need to book train or bus tickets in advance. Buy your ticket at the station directly. Many buses connect to Gokarna from cities such as Madgaon (125 km), Mangalore (225 km), Dabolim (140 km) and Bangalore (475 km). The exact routes and details change too often so you’ll have to ask at the bus station. Often you’ll have to transfer buses multiple times so it is not recommended. If you want to take the bus from Dabolim airport you can get a taxi to the local bus stand, take a bus to Karwar, and transfer to another bus to Gokarna. From the airport or train station you can take a taxi to our location. This is our guest’s preferred option. Be sure to book at the airport’s pre-pay designated stations for the best price. Prices change all the time but should be around $65 USD one-way. We can assist with pre-booking a taxi but it’s often cheaper if you book direct at the airport. The taxi will take you to Gokarna town, or to the entrance of Om Beach. It’s better to take the taxi to Gokarna and then take a rickshaw to Om Shree Ganesh. It takes 3.5 – 4.5 hours to get from Dabolim airport to Gokarna town by taxi. Average is 4 hours. It depends on traffic, time of day, etc. Important: There is no ATM at Om Beach so take money out PRIOR to leaving Gokarna town. No need to exchange money in advance – just use ATM. We recommend SBI (State Bank of India) because they typically don’t charge fees. From Gokarna train station: hire a tuk tuk (~400 Rupees, one-way) and ask them to drop you at Om Shree Ganesh at Om Beach. If they don’t know where that is, ask to drop at tuk tuk stand in Gokarna, and ask there to be dropped at Om Shree Ganesh. If taxi drops you in Gokarna town (recommended): hire a tuk tuk (~200 Rupees, one-way) and ask them to drop you at Om Shree Ganesh at Om Beach. If taxi drops you at the entrance to Om Beach (not recommended): you can walk 20 minutes down the cliff steps and through the beach until you reach the Om Shree Ganesh. Once at the Om Shree Ganesh Restaurant, ask the front desk how to get to Shanti Yoga, or follow signs. $ 49 Why pay more at a resort? Our yoga retreats work differently than teacher trainings. Trainings are set programs. They are intense, standardized programs. A yoga retreat is not – it’s vacation. We price retreats by the day. The cost is $49 USD/night. This is significantly less than what you’ll spend at a resort. The cost includes a single room, 3 meals, and up to two yoga classes per day. What’s more, if there’s a teacher training in progress during your retreat you may attend any of their classes – no additional fee. This gives you the opportunity to learn even more about yoga. These classes are not mandatory – the choice is yours. This is your vacation.